Ōita (大分市, Ōita-shi) is the capital city of Ōita Prefecture. In the 16th century, Ōita became a center for trade with the Portuguese. Some famous places in Nishinomiya are Koshien Stadium, where the professional baseball team the Hanshin Tigers play, and Nishinomiya Gardens. 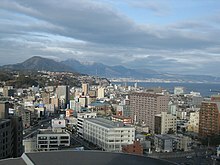 Ōita is on Beppu Bay in northeast Kyushu. ↑ 1.0 1.1 1.2 Nussbaum, Louis-Frédéric. (2002). "Ōita" in Japan Encyclopedia, p. 742. ↑ Nussbaum, "Ōita-ken" at p. 742. This page was last changed on 29 April 2013, at 22:36.